Jürgen has broad leadership experience from global industrial companies within IT, telecommunication, and machine-building. He is passionate about the digital transformation in the cooling sector and constantly challenges innovation to leverage e.g. the potential of energy storage across Danfoss. In 2008, Jürgen joined Danfoss as Vice President for Industrial Automation, and since 2015, Jürgen Fischer has been President of Danfoss Cooling. Jürgen holds a master’s degree in Economics from the University of Augsburg. In addition, he holds several degrees from executive education programs at INSEAD and IMD. As the global temperature rises, sustainable space cooling solutions are more important than ever. The IEA Future of Cooling report estimates that the energy demand for air conditioners is expected to triple by 2050; leading to a space cooling energy growth of 30% in Europe by 2050. The increase in demand for space cooling can put severe pressure on the power grid and challenges to achieve the Paris agreement goals if nothing is done, warns the IEA. Luckily, the report also estimates a saving potential for today’s space cooling by 50%. If we use the best available technology, we will secure cooling that is both sustainable and provides comfort for millions of citizens. Minimum Energy Performance Standards (MEPS) are the easiest and most efficient way to ensure that only energy efficient cooling devices are placed on the market. The roll-out of labelling schemes across the globe ensures that we use cost-effective technologies. This reduces the total cost of ownership for the devices and benefits of the end-users. However, the use of MEPS needs to be combined with strong market surveillance and enforcement to realize its full potential and ensure all stakeholders are complying with the same rules. Cooling systems need constant maintenance to ensure that they deliver the promised energy savings over time. According to the European Commission, 75% to 90% of the EU building stock is inefficient. But only 1% of it is renovated each year. There are two priorities for policy makers: one is to accelerate the retrofit of existing buildings and their cooling systems and the other is to improve their maintenance routines over time. The Energy Performance of Buildings Directive (EPBD) goes into the right direction and addresses these two priorities. The stronger focus on the renovation of the existing buildings, e.g. via the long-term renovation strategies and on the optimization of technical buildings systems, such as cooling, heating and ventilation systems are identified. The next critical step is to ensure a good implementation of the EPBD at national level. With today’s technology we can use supermarkets as giant batteries which allows us to store fluctuating renewable energy sources and balance the energy system. Is heating the future of sustainable cooling? Using excess heat coming from cooling applications, i.e. in supermarkets, we can re-use it to heat our water or warm up our buildings — saving energy and money and reducing the pressure on our energy systems. We need to break down silos to unleash the benefits derived from connectivity across sectors. In a district cooling system chilled water is being used to cool down buildings and therefore save energy. Copenhagen is a great example, where a district cooling system was established to service hospitals, office buildings, and schools. The result was win-win, with CO2 emissions reduced by about 65% and consumer savings of 80% on energy costs. 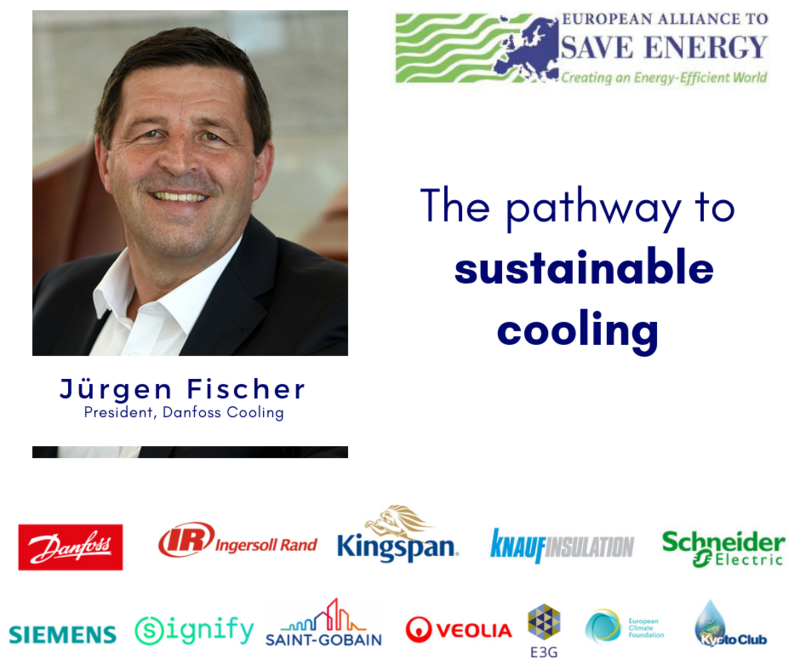 Looking at the benefits, it is essential to unlock its full potential with new heating and cooling renewable targets. The new national energy and climate plans must be adopted according to the new Governance Regulation on the Energy Union. To unlock the full potential of energy efficiency and meet the future energy demand, we need to enable new business models and demand-side management. Energy storage is the key to unlocking flexibility in our energy systems, which can ultimately turn energy consumers into prosumers. We need policies to encourage the re-use of heat that would otherwise be released into the air. Looking at today’s best available technology, the next step needs to be the implementation of ambitious legislation and regulations to increase energy efficiency across sectors. The industry is ready and, together with policymakers and governments, we can unlock the full potential of energy efficiency and open the pathway for a lower energy demand. Let’s join hands across sectors and work towards a cooled and environmental-friendly future together.